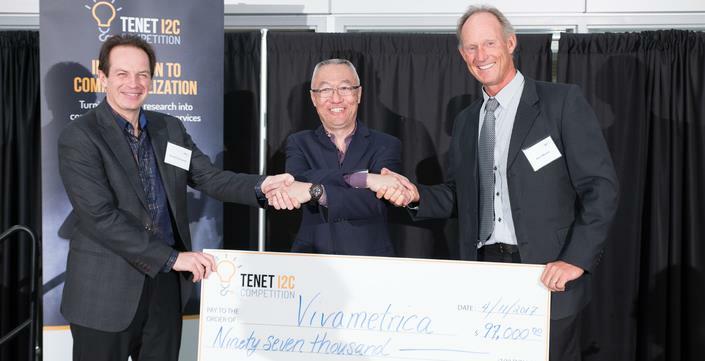 Calgary-based Vivametrica is one step closer to commercialization after winning the second annual TENET i2c competition and claiming the $100,000 grand prize that goes with it. Vivametrica’s analysis software converts wearable device data—step-count, heart rate, sleep data—into useful health risk information. These statistics can then be used to help health and wellness providers, as well as others, better understand the health of their clients. The Vivametrica team has completed a pilot project in China and will use their prize money to get the business ready for the larger companies that they envision as future clients. TENET I2C competition is a “Dragons’ Den” style competition that awards up to $100,000 to a team for commercialization of an innovative health product or service. Established with a generous gift from TENET Medical Engineering and contributions from Alberta Innovates and other partners, the TENET i2c competition was developed to support and encourage the next generation of medical entrepreneurs. Read more about the TENET I2C competition and Vivametrica in UToday, the University of Calgary’s newsletter. Check out last year’s winner, Ammolite BioModels, and the work they did to create life-like bone models for researcher training. For more information on future TENET i2c competitions and other Alberta Innovates partnership projects, email Bindi Ferguson, Senior Manager, Industry & Technology, or call (780) 306-1099. The Tenet i2c competition is supported by Alberta Innovates, MNP LLP, Gowling WLG, Innovate Calgary, Hunter Centre for Entrepreneurship and Innovation at the Haskayne School of Business and the McCaig Institute for Bone and Joint Health.